It took a seemingly impossible challenge to bring out the best in an LSU team that had squandered so much potential this season. Missing leading scorer and rebounder Glen "Big Baby" Davis, the struggling Tigers got 18 points from Terry Martin, 17 from Garrett Temple and stellar defense from everyone to pull off an impressive 66-56 upset over No. 3 Florida on Saturday. "I was coaching so hard and trying to do everything I could in the last five minutes to make sure we won that game," said LSU head coach John Brady, who spent most of the game stomping and screaming on the sidelines. "We got upset with each other a little bit, but we all hugged after it was over. I was so emotional when I was talking to them after tonight's game I couldn't even finish talking." It had been months since LSU had been able to run out the clock while basking in the glory of a standing ovation, the rowdy student section chanting "Over-rated," at a highly ranked opponent. LSU (15-13, 4-10 Southeastern Conference), once ranked as high as sixth this season, had lost three straight coming in and nine of 10 before hosting a Florida team that had been No. 1 a little over a week ago. This game offered an opportunity to salvage a good memory from what will be a lost season unless the Tigers can somehow run the table during the SEC tournament, the only way they could get a bid to the NCAA Tournament. Florida (25-4, 12-2), which had already wrapped up the SEC regular season title and had set a new school record for single season victories, had little riding on the game and played like it. "They looked like a team that just won a championship, and competing maybe wasn't the most important thing on their mind here today," Florida coach Billy Donovan said. "There's got to be a level, when you're competing, a level of nervousness, a level of on-edge, a level of concern," Donovan said. "And I think what happens is, that level of edge and concern starts to disappear the more you win. We've got to get to that point where that concentration level on block outs and rebounding is where it needs to be. But give LSU credit. they played great. They contributed to us playing the way we did." The Gators missed their season averages in numerous categories as they lost for the second time in three games. Normally a 42 percent shooting team from 3-point range, the Gators were 2-of-17 (11.8 percent). They were 4-of-12 on free throws and fell 24 points short of their 80.3 season average for points. Tasmin Mitchell scored 11 for LSU, which outshot Florida 51.1 percent to 44.7 percent and outrebounded the Gators 35-22. Martin's jumper in transition ignited a decisive 8-0 LSU run that gave the Tigers their largest lead at 53-35 with about five minutes remaining. Florida got no closer than eight points after that. "Florida came back in the second half and made those few runs ... but we just stayed poised, played as a team and came out with the victory," Mitchell said. Al Horford led Florida with 13 points, while Chris Richard had 12 and Corey Brewer 11. "I'm worried about our team right now. We just got to get back in there and just figure this out," Horford said. "If it's not going well on offense, guys quit on defense. That's something we never did last year, so that's something we have to deal with. ... We've got to be able to overcome that and know that some nights we're not going to score 80 points." Florida's guards struggled, with Taurean Green going 1-for-7 and Lee Humphrey 2-for-7. Green was guarded primarily by Temple. "What Garrett did on Green tonight is as good as it gets," Brady said. "We were able to take Taurean Green out of the game. It shows how important a team's quarterback is," Brady added, using a football analogy that he figured would resonate with LSU fans. "Our people here will get that; when I say quarterback their ears will pek up. We took out their quarterback, which is the point guard in basketball." 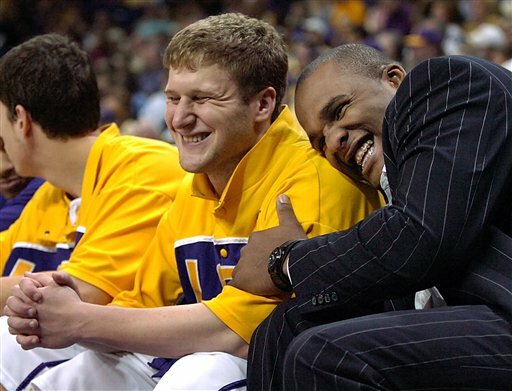 Davis, LSU's best player, spent the game on the sideline in a pinstriped suit because of a pulled right quadriceps that also kept him out of Wednesday's 70-63 loss at Kentucky. Through the opening 10 minutes, however, the Tigers made up for his absence with 83.3 percent shooting in building a surprising 24-12 lead. Temple hit his first four shots, including a 3-pointer, in scoring 10 points during that span. The Tigers' accuracy dipped during the next 10 minutes, but the intensity of their defense and rebounding remained high as LSU maintained a double-digit lead. LSU outrebounded Florida 20-8 in the opening half and held the Gators to 39.1 percent shooting during the period. The Gators trimmed their deficit to 28-17 on Brewer's 3-pointer. But Magnum Rolle hit a tough leaner and dunked soon after, then Dameon Mason sank an off-balance running hook before Brewer's runner cut LSU's lead to 34-21 at halftime.